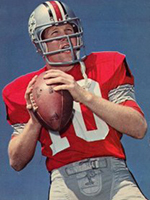 With Rex Kern at the helm, Ohio State rolled to a 27-2 record, won the 1968 national championship, captured two Big Ten titles and played in two Rose Bowls. To win the national championship, Kern led OSU to a 27-16 win over Southern California in the Rose Bowl. He was named the games Most Outstanding Player. Additionally, the Buckeyes narrowly missed out on the 1969 and 70 wire service national championships, losing the final game in both of those years after being ranked No. 1 going into their respective season finales. In 1969, he was named an All-American. In 1970, he was elected team captain. Kerns statistics, as impressive as they were, tell just half the story. The fiery redhead was an emotional leader who displayed a penchant for making big plays when most needed. He was a winner in every sense of the word. Earning three degrees from Ohio State, he played four seasons in the NFL. He was elected to the Ohio State Athletics Hall of Fame in 1978 and the College Football Hall of Fame in 2007. Year GP Att. Comp. Yards TDs Int.